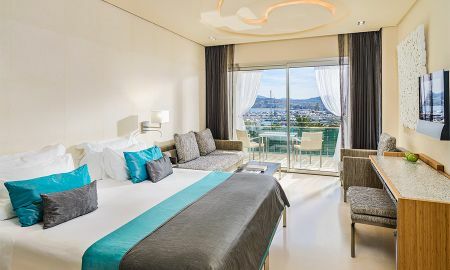 Aguas de Ibiza Grand Luxe Hotel offers a dreamy 5 star experience with delicate luxury tempered by warm Spanish humility. 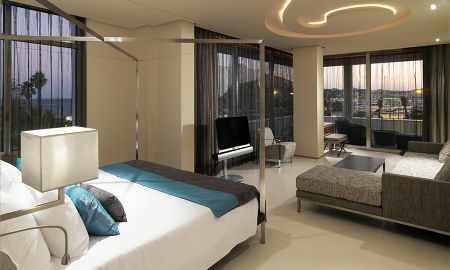 The hotel is the perfect place to enjoy the wondrous island of Ibiza. 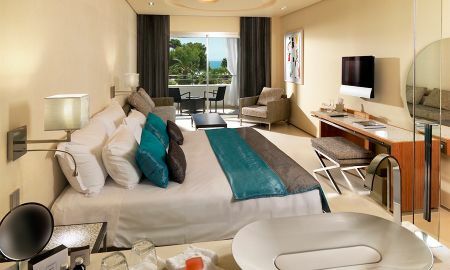 Aguas de Ibiza Grand Luxe Hotel offers a very personal interpretation of luxury through an age old family business. Their clear commitment to authenticity makes unique experiences possible. 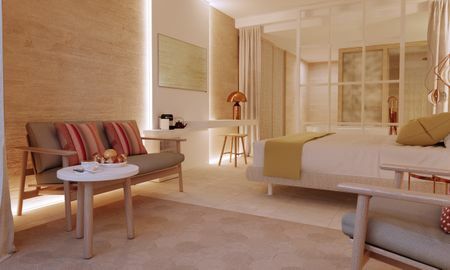 Light and textures converge, creating an ambience of “only the best.” Experience Ibiza’s pleasure firsthand. 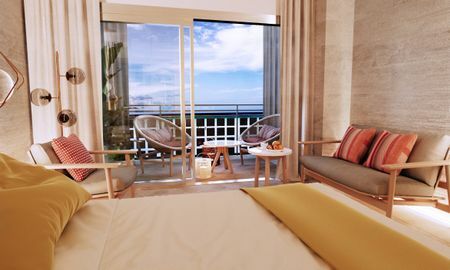 The rooms of Aguas de Ibiza Grand Luxe Hotel are flooded with light, breaking across the spacious terraces and gleaming windows where visitors can enjoy spectacular views of the Mediterranean and the island of Formentera. Glistening light penetrates the bathrooms, reflected in glazed wall tiles, creating a sensual, sophisticated and warm ambience for all. 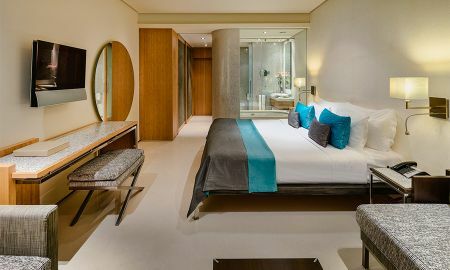 The equipment is selected with care, and includes a TV Bang & Olufsen design, spacious hardwood cabinets, and an elegant and subtle technology which you can freely enjoy throughout your stay. 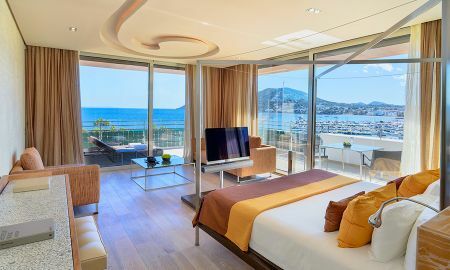 Aguas de Ibiza Grand Luxe Hotel offers three outdoor pools with gardens, terraces and spectacular views of the island. The Revival Spa, with more than 1,500 m2, is dedicated to visitor’s pleasure, health and relaxation offering therapeutic massages, Eastern Ibiza salts baths, aromatherapy and exclusive facial and body treatments. The restaurant Oligo prepares an individualized Mediterranean buffet breakfast. The Alabaster Lounge, with creative tapas and snacks, is a great place to arrange morning meetings. On the roof of the hotel and by the pool, the chic bar prepares oysters accompanied by champagne. Air Ibiza offers a fusion of Japanese and Mediterranean cuisine with exotic flavors and an extensive menu of domestic and international wines, including authentic Japanese sake. The restaurant La Sal has a unique cuisine you can enjoy any time of day. 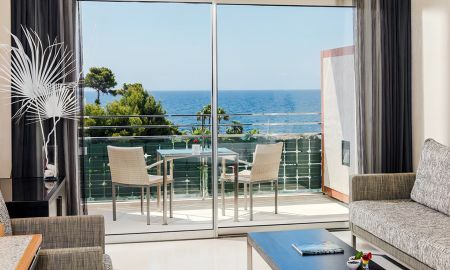 Aguas de Ibiza Grand Luxe Hotel located on the east coast of the Balearic island, specifically in the town Santa Eulalia del Rio, on the beach and opposite the marina sports. 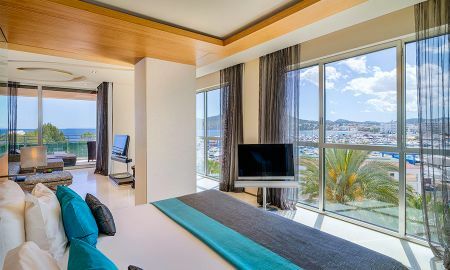 Its location is perfect, 5 minutes from Ibiza Golf Club, to 15 of the historic city center of Ibiza (Eivissa), and 20 of D'Evissa Airport. Please note that when booking 3 or more rooms, the group policy will apply. Therefore, if it is a reservation with a flexible rate, the first night will be charged to the credit card provided by the client, in case of canceling within the established deadlines or not presenting to the hotel, the first night will not be refunded . In the case of promotional rates, the total stay will be charged (long stays, early booking, other promotional offers). For « Long Stay Promotions » the first night is non refundable and may be charged by the hotel anytime after the booking.